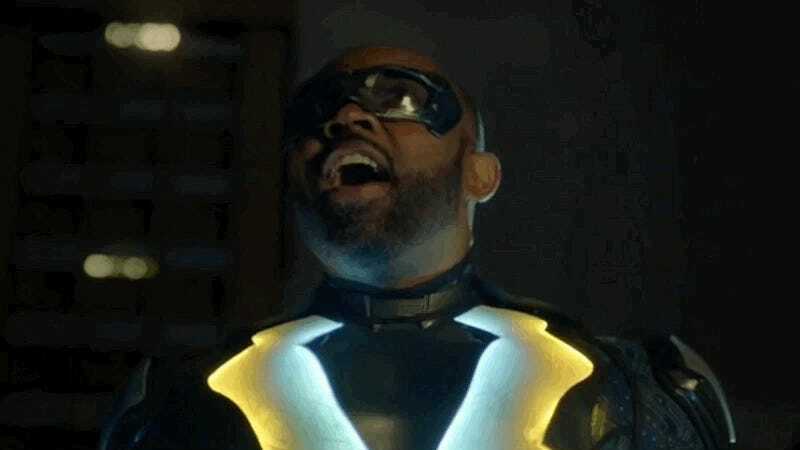 Though death and loss have been big parts of Black Lightning since the beginning of the series, the past few episodes were full of enough hope and optimism to almost convince you that maybe, just maybe, Jefferson Pierce might be able to get a handle on the crime wave sweeping Freeland. But the reality of the situation is that between his responsibilities as a father, a principal, and a superhero, Black Lightning’s bring stretched thin, all while the 100 gang continues to metastasize like a cancer that’s quite literally killing the city. Like all formidable crime outfits, the 100 gang is, at its core, a business that’s chiefly concerned with turning a profit as it asserts itself as the unofficial center of power within the city. In the case of the Freeland operation, this means operating an extensive drug network designed to get the city’s youth addicted to Green Light, a drug described as a blend of crack and PCP that gets you addicted after a single hit—but it also imbues users with temporary super-strength, durability, and a tough of homicidal rage. Green Light moving through Freeland is the sort of problem that an individual superhero legitimately can’t take on alone because of the way the drug’s impact spreads like a virus rather than a singular target to hit. The time, energy, and information it would take to root out the suppliers, distribution networks, and drug runners that bring Green Light into the city simply aren’t resources that Jefferson has at his disposal and in the long term, that’s going to be a major issue for him. “Black Jesus” introduces Bernard, a Garfield High student who becomes addicted to Green Light, as both a cautionary tale and a warning of things to come. If Black Lightning isn’t able to head off the 100's further advances on Freeland, the city’s soon to be overrun with drug-addicted pseudo-metahumans who’re willing to kill for a fix. We don’t really know all that much about Lady Eve or what the upper echelons of the crime syndicate she works for ultimately want out of Freeland other than to control it, but it’s not difficult to imagine that she’d be pleased to see the place descend into a state of total lawlessness. Evil like hers, we see, isn’t as concerned with the out and out destruction of targets, but rather maneuvering her opponents into positions of extreme vulnerability she can take advantage of for her own sadistic purposes. 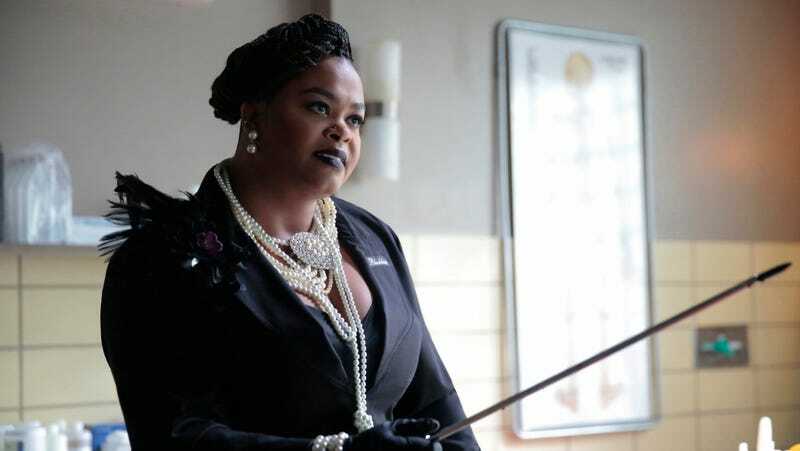 Vacuuming the bodily fluids out of a living person might not have been the most subtle way for Lady Eve to kick off an episode, but again, it’s a promise of the things she’s got planned both for Freeland and Black Lightning. At least a portion of the promise is meant for Tobias Whale, who’s quickly beginning to seem as if he’s in deep over his head, which could go either way in terms of his characterization. So far Tobias, like all of the 100 gang members, has been at his strongest and most compelling when he’s coming from a position of power. For everyone else involved in this war (RIP Lala and Will), faltering even for a moment has meant dying soon after and Tobias’ shrinking before Lady Eve doesn’t at all bode well for his future. Keeping secrets—specifically that he didn’t know whether Black Lightning was really dead—is what got Tobias into the mess he’s in, but “Black Jesus” makes clear that secrecy as a whole is something the people of Freeland could do with a lot less of. The deception between Gambi and Jefferson and Jefferson and Anissa is going to come to a head in a potentially negative way at a time when all three of them need to be working together to defend the city. But, as is so often the case with “well-meant” secrecy, none of them seems to realize that they’d be much better off standing in the light together than keeping one another in the dark. I’ve said it before and I’ll say it again: Jill. Scott. Is. Terrifying. And also the best part of this show. These kids trying to buy drugs in broad daylight on the side of the street need to learn some subtlety. “Was he dressed like Earth, Wind, and Fire?” is precisely the kind of perfect line that I would only ever expect to hear from a writer’s room filled with black folks. 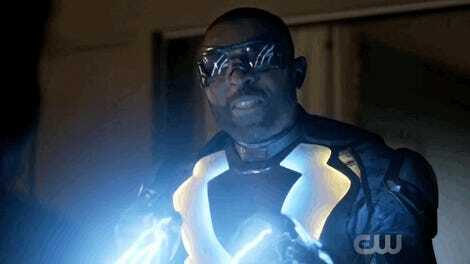 Black Lightning’s electric vision is a nifty addition to his powerset, but it makes you wonder whether Jeff—in all the time he’s had these powers—ever sat down and figured out what all he could do besides shock people. Green Light sounds like a drug thought up by the Law & Order: SVU drug bot. Who in their right mind would try a drug that immediately got you addicted and had a strong chance of making you want to kill people? Stick to Tide Pods, kids.